For many months now, College des Savior has been working with the nearby Kapini school to bring teachers into the GBA curriculum and expand the base of community knowledge and expertise. This has involved one-on-one mentoring and observation, group reflections, and staff trainings. Now, as erosion threatens the Kapini school’s neighborhood, the two schools are using the skills they have been practicing to tackle a whole new type of challenge. College des Savior and Kapini staff met with community members, students, and parents in early March to discuss the erosion issue and brainstorm solutions. 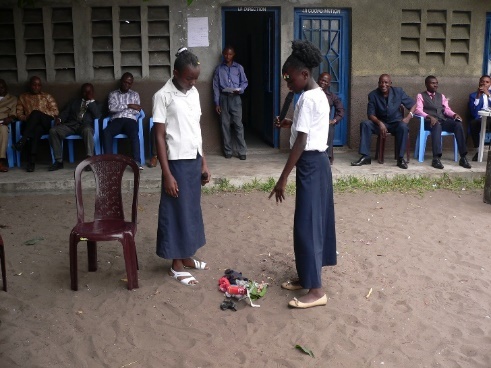 GBA PM, Dr. Jerry Kindomba, introduced the meeting with a community-building game and called for the group to think of their actions like that of a tree with many branches, able to spread good work throughout the community. The group listened to an expert speak on potential solutions to the erosion issue. Together, they forged a three-step plan of action to 1) promote local and government awareness of the issue, 2) redirect the road in the erosion area, and 3) use sandbags and plant bamboo trees to help control the erosion. Just a week later, College des Savior and Kapini participated in another community meeting to educate additional community members about the campaign. College des Savior and a group of Kapini parents donated erosion prevention sandbags to the Kapini school to kick-off the donation effort. Another community member has also pledged to donate 2500 bags, and the initiative has the backing of several local government officials. A handful of pastors from area churches also agreed to take the messages to their congregations. This meeting also included a walk-through of the affected areas to talk to people in-person about the issue and the efforts to resolve it. A third community meeting took place on April 2nd. College des Savior and Kapini are proving that their relationship and practiced skills extend beyond the classroom and into real life. Giving Back to Africa’s curriculum encourages the solving of real-world problems through collaboration that leverages community resources, emphasizing that all parties have knowledge and tools to bring to the table. This is exemplified through the use of knowledge of the local area and ecosystem, sandbags, bamboo trees, and personal connections to fight the erosion. Willing to work together on this pressing, local issue, the two schools are applying their lessons learned not only about science and nature, but also about engaging the community, employing assets, and unity. Four students, who have all studied a combination of the GBA educational modules over the past five years, joined the teachers in reflection. The students range from 6th to 11th grade. 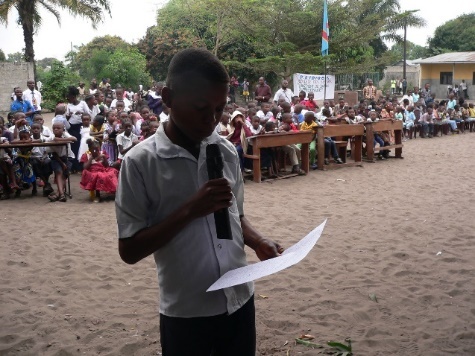 In a presentation to the teachers and guests, the students reviewed key points from the clean water, waste management, nutrition, and agriculture/sustainability curriculums and demonstrated the application of those lessons into their lives. Ebimba, the 11th grader, elaborated on the water cycle and drew the connection between unclean water and water-borne diseases. Sixth grader Pombo spoke on the difference between biodegradable and nonbiodegradable waste, and all students presented on highlights from the curriculums they had participated in, as well as the school garden. The students took questions from the group and shared anecdotes from their personal lives. Kongolo, from the 8th grade, helped convince his neighbors to start a garden, and in doing so, provide healthier food options for the family. After the presentation, staff made a visit to Kongolo’s home to see his own garden and animal husbandry work and talk with his family. They also saw the neighbors’ garden that Kongolo influenced-- which used to be just empty land! Ebimba shared about his system at home to separate and biodegradable and nonbiodegradable waste. Ntumba Nadege, in 7th grade, discussed nutrition with her family, asking her mother to incorporate a larger variety of foods, and locally available ones, into their diet. Attendees were impressed by the students’ presentational skills and their demonstrated mastery of the curriculum material. Even though the students had little time to prepare for the presentation, their energy was high and their efforts were well-received by all. The students led the group with the skill and composure of teachers themselves, having come full circle in learning, applying, and now sharing their knowledge with others. Next up for the students and teachers in an Integrated Review of material, covering many topics and using peer groups and innovative strategies for the review. In June, the teachers met and shared the changes they had observed in each other since they had begun meeting. 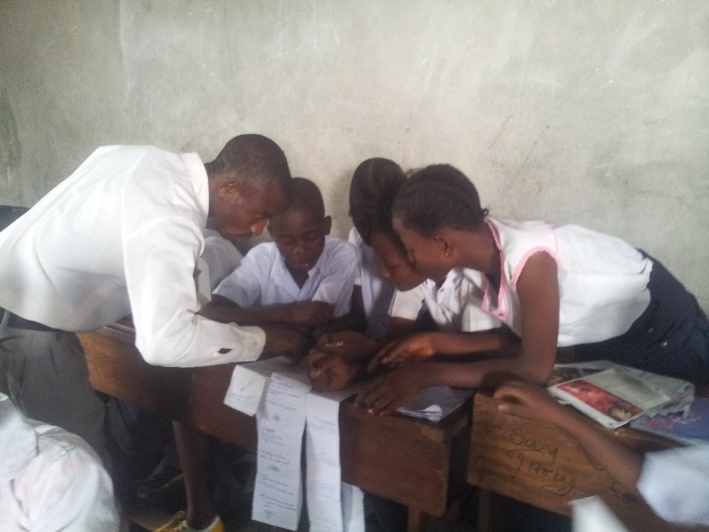 Teachers noted the introduction of new teaching techniques, like using games and brainstorming, and they also spoke of changes in their ability to relate to the students and their school. Teachers from both CS and Lukunga shared their testimonies for new teachers to learn about how the program has impacted them. Several students also shared their testimonies. Kashila noted that: “The teachers are asking us every time after they teach something, “Do you understand?” They are not tired and help us to understand.” Others commented on how they are becoming leaders in their community and have learned conflict resolution skills. Many people in attendance commented on how they’re seeing the seeds of schoolwork bear fruits in the community. This was also evident at the Fete de Presentation, where CS students courageously performed lessons from their schoolwork for a public audience of over 300. The Lukunga teachers attended the Fete and will soon meet with the CS teachers and ten teachers from the Kapini school to evaluate the event and further engage in teacher learning. The students are hard at work preparing to break ground on the Students’ Learning Garden. They will compile research on soil, insects, and other essential topics from reading and will be guided by the help of community members. One such group of community members is the staff from the local monastery, which the students visited a few months ago on a field trip. Teachers will also gather information online to share with the students. 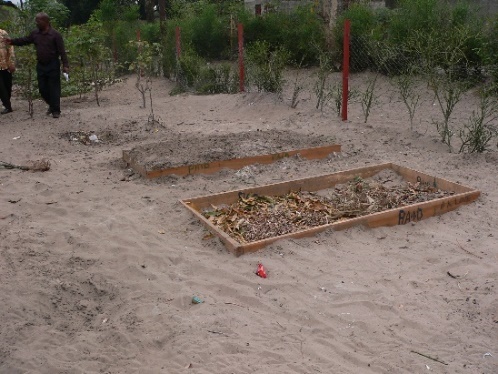 On the U.S. side, we are raising money for supplies needed to start the garden. To find out more about the learning garden and to make a donation , click here. 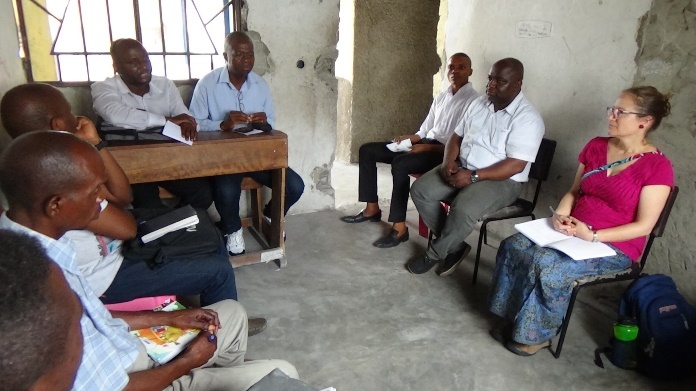 At the beginning of April, the College des Savior teachers and Dr. Jerry met with the Lukunga teachers, the group of teachers that they have been working with over the past several months. The teachers shared what they had worked on since the last meeting and what they wanted to practice during the students’ upcoming school vacation. 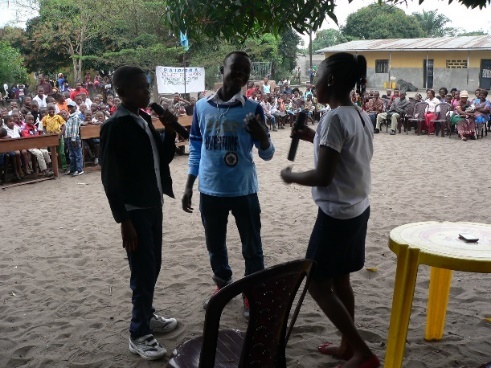 The Lukunga teachers talked about techniques from College des Savior that they want to implement. Virginia said, “I want to act like Mr. Pombo in getting students outside to observe.” Célestin added: “I want to use stories like Mr. Chancard.” Dr. Jerry encouraged the teachers to interact openly. Caro commented that, “CS students are very brave. I will help our students to become like them by sharing this with them.” Photos from the meeting are below. 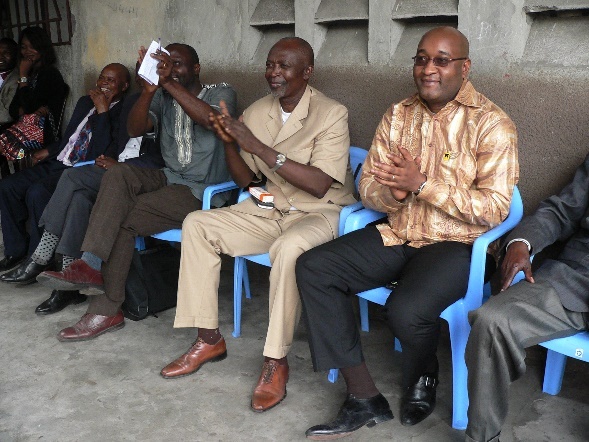 At the end of April, Dr. Jerry, Mr. Pombo, and Mr. Emmanuel went to visit the Lukunga teachers in their classrooms. 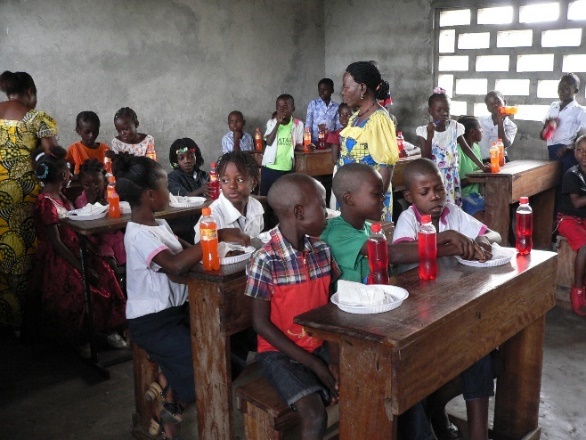 They noted the overall safe learning environment among the Lukunga teachers. Ms. Sarah, a 9th grade teacher, was smiling and teaching with patience and encouragement, and the students were active and engaged. 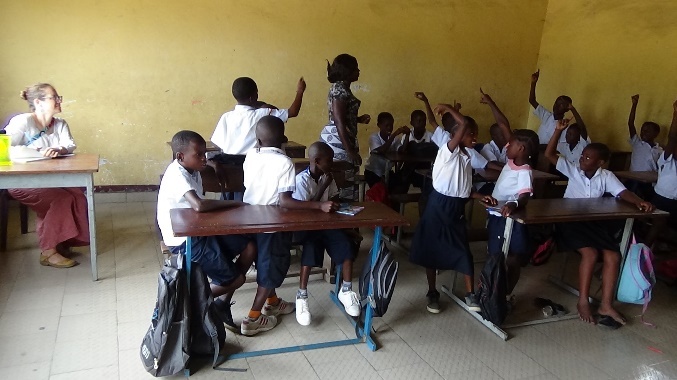 In Célestin’s 6th grade class, students enjoyed a game of 20 questions, and in another 6th grade class, Corneille used a technique that the College des Savior teachers employ—outdoor observation. 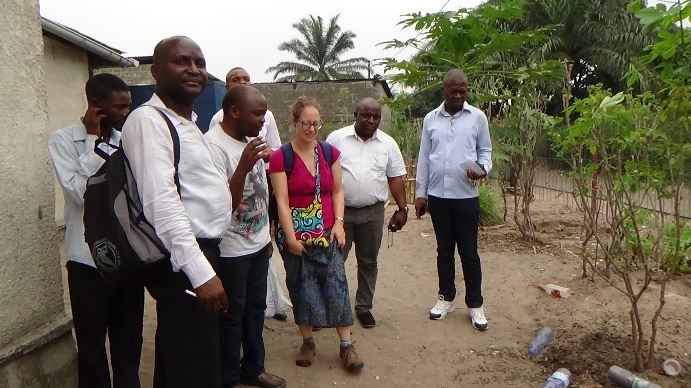 The visit was part of the ongoing relationship between the two groups and the evaluation of their knowledge-sharing. In May, the teachers from both schools will meet at Lukunga for another Teacher Learning Circle. Students participating in the 20 questions game. A sixth grade class practices their outdoor observation skills. This year is a huge one for Giving Back to Africa! After three years of learning about topics ranging from to waste management to clean water, as well as applying these topics to work with the community, the students will mark the end of the Sustainability Curriculum with the creation of a students’ learning garden. This garden will not only help students to further integrate the lessons they’ve learned into a tangible, community-based project, but it will also facilitate the further exploration of passions related to agriculture and the environment. The students recently had the opportunity to visit a monastery and observe the various aspects of homesteading there. Participating in the planning and construction of the garden will continue to nurture the seeds of knowledge that the students have planted. Additionally, the garden will serve as a community catalyst, bringing together community members to learn from demonstration gardens and to continue to build ties with the school and personal connections with the students. The development and maintenance of the garden will foster leadership and management skills, health education, and food security through the encouragement of home growing practices. This garden will have impacts that reach root-deep. We need your help to make this garden a reality. Please join our CrowdRise campaign and make a donation towards supplies for the garden. You can access the campaign by clicking here. Just think, donating $20 could provide a shovel to help break ground on this exciting project! Please visit our CrowdRise page for more information and share the campaign link with friends and family. Thank you for your continued support!